Handheld air compressors can inflate tires, basketballs or even air mattresses. Being handheld means these types of air compressors are compact as well. They provide one of the best solutions in terms of overall functionality, especially in the conditions in which they can be transported inside a trunk. For home use, the best handheld compressors do a particularly good job with many objects such as footballs or car tires. But not all handheld air compressors are the same. From their PSI capacity to limitations on continuous use time and from simple designs to integrated digital controls, there are important characteristics to look at. Currently, modern handheld air compressors come with more features to stand out. It is why those new to this equipment can also feel confused at times. This is why it is necessary to go back to basics and see what actually makes a handheld air compressor and what are its must-haves. The power cord needs to be long enough to reach tires when connected to the cigarette lighter in the car. At the same time, some of the best handheld air compressors come with additional AC wall cords which allows these portable machines to be used inside the home as well. The size of the handheld air compressor is important. Since most of them sit in the car, drivers don’t actually want them taking up too much space in the trunk. If some new cars already come with a handheld air compressor, most of them simply need them to be purchased separately. From a standard 35 PSI to 150 PSI, handheld air compressors react differently as they have different inflating strengths. Unless they are used for large objects such as inflatable swimming pools, most handheld air compressors should be reliable for occasional use. Why we like it: The compressor is making its mark for many users. It has proven popular over the years and it still remains one of the leading products when it comes to reliability. The efficient design of the air compressor is packed with functionality. With an integrated digital display, users can always ensure they have an accurate reading on the actual pressure gauge. The display also allows users to set a certain ideal pressure for inflation. Based on programmed presets, this can be practical for minimum user intervention. In front of the air compressor, the manufacturer added an LED work light. It represents a simple solution for those seeking the ultimate practicality when changing tires. For example, needing to deal with a flat tire during the night while on the road might be complicated in low light conditions. Smartphones are not always reliable for battery power to provide enough light around the tire. In this case, the handheld air compressor is the best choice. The good news is that even with a built-in screen and flashlight, the air compressor is not too large. All users want to know what the compressor can inflate. With multiple included nozzles, it can handle any objects. From beach inflatables to tires, the compressor can handle any situation. Of course, each inflatable comes with its own recommended PSI. This is why each product needs to be inflated according to the recommendations of the manufacturer. A good example comes with tires. They need to be inflated in certain parameters for optimum performance. Tire pressure affects brake distance, tire wear, and fuel consumption. But apart from this must-haves, the air compressor also comes with dual power functions. 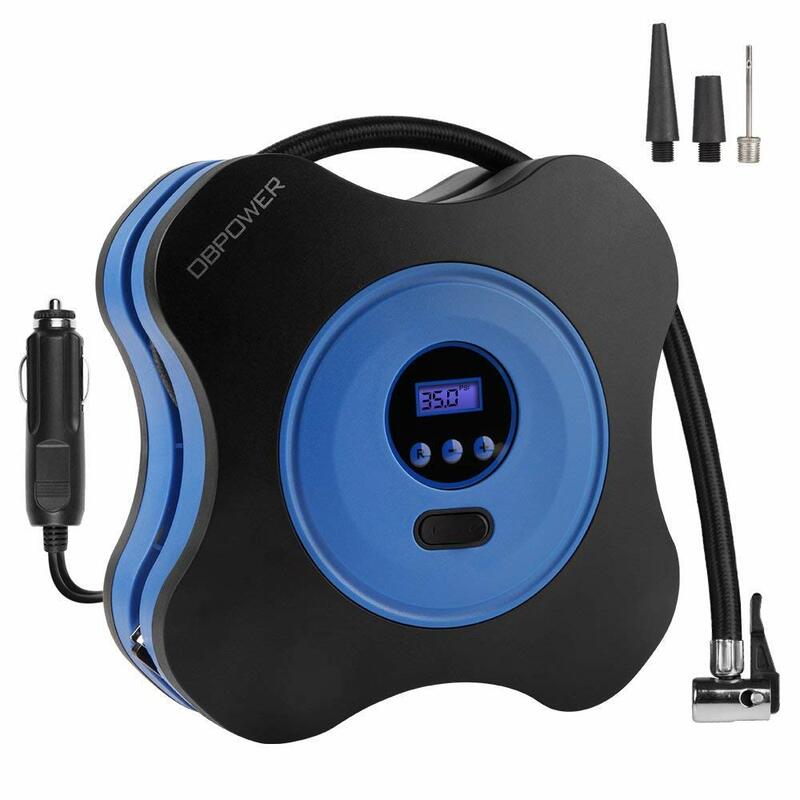 With a power cord for the car’s cigarette lighter and a power cord for the wall’s AC socket, the handheld air compressor has true versatility. Used on tires and on various inflatables around the house, it can be an all-in-one solution for most home users. For general inflation tasks around the house, the handheld air compressor represents a strong and versatile solution. It is also among the affordable reliable compressors. Why we like it: At 198mm in length, the air compressor is truly portable. It also looks different from all other air compressors on the market, making it an attractive choice to carry in the trunk. Made with a distinct metal tube finish, the air compressor impresses with its design. Unlike the regular box-shaped compressors, it comes to challenge what is known about these products. The controls of the compressor also have plenty of design attention given. These controls are placed on one side of the tube-shaped air compressor. They are also placed next to a built-in digital display with blue backlight. This portable air pump represents one of the distinct choices for design-conscious users. At the same time, it comes as one of the top solutions for portability. Even if it is actually made for mobility, it also comes with an AC adapter which means it can also be used inside the house. But an interesting design characteristic is given by its built-in battery. This way, it manages to become an independent handheld air compressor. It takes about 1.5 hours to fully charge its lithium battery. As a result of its power independence, it can be considered by those who love camping. Inflating the car’s tires or the bike’s tires while out camping is now independent of power sources. There are two added LED lights on the air compressor. This means that inflating the car’s tires during the night should not be a problem. Together with the backlit display, it allows users to clearly see the pressures they are working with. This pressure is measured in PSI, Bar, KPa or kg/cm2. In terms of convenience, the handheld air compressor handles really well. For this reason, it manages to satisfy those who want to fully inflate a car tire within 6 minutes. Most importantly, those who need sharp results can also consider the compressor for its accuracy. Unlike most competing products, it actually comes with +/-0.5 PSI accuracy. Of course, its characteristics allow it to be used in various scenarios. With accurate pressure measurement and an included battery, the handheld compressor can even be used by those who love to cycle during the night. Its maximum pressure is 150PSI. The air compressor inflates a normal car tire up to 35PSI in 5 minutes. From cars to bikes or from motorcycles to footballs, the elegant air compressor represents one of the best solutions for those seeking the ultimate energy independence. Why we like it: With just a few controls, the handheld air compressor manages to offer what’s needed for effecting inflation of tires, mattresses or sports balls. Made with a simple design, this 12V-powered air compressor is reliable. It offers a robust design. For most users, robustness actually translates into increased durability. Even more, there is enough room to look further into this with its protected airflow tube design. There is an LED light added to the air compressor. It might not be the largest light in its class, but it certainly comes with a considerable advantage over the standard entry-level air compressor. When it comes to the operation of the compressor, users don’t need any special training. There is a button which activates the LED light. Selecting unit and choosing target pressure are the only two buttons remaining on the air compressor. Users can easily monitor the entire process using the built-in digital display. Having the ability to continuously inflate a tire or a basketball makes using the compressor straightforward. Even in these conditions, it still comes with auto switch-off functionality. It allows the compressor to switch off every 4 minutes. This self-protective function has been added in order to avoid overheating or ultimately damaging the air compressor. 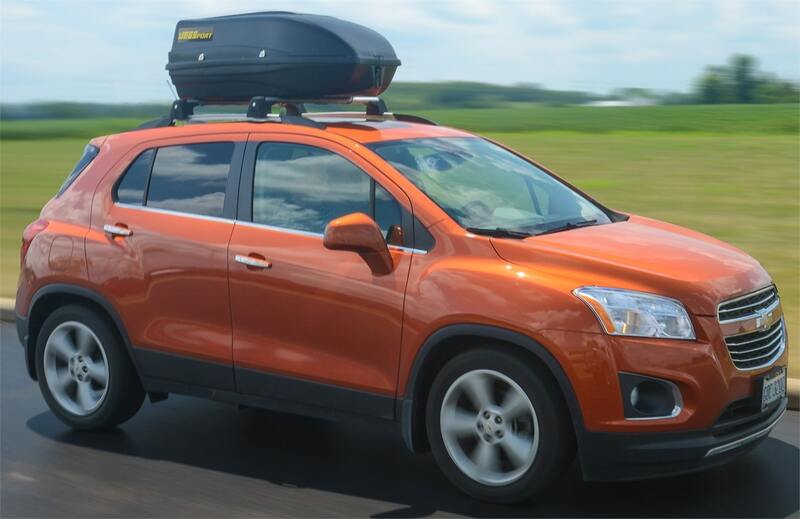 With the help of a 12 feet power cord, users can easily reach the rear tires of the car when needed. But the air compressor can also handle other objects. The manufacturer ships the product with 6 nozzles to inflate all types of tires and balls. Furthermore, when it comes to sensitive sports equipment, the pressure is important and Auto-Vox knows this. It is why the air compressor comes with a +/-1 PSI accuracy. Unfortunately, the air compressor only connects to a 12V outlet. This limits its use for car-only inflation. It cannot be used inside the house. If this is not an issue, it can be an accurate and durable solution for many drivers. Made with a robust design, this handheld air compressor comes with accurate results. It is also protected by an auto shut-off function. Why we like it: Those seeking fast results can consider the air compressor for its leading performance. Based on durable plastics, the air compressor is among the most durable solutions in its class. It comes to impress those seeking durability. But its design also features extras such as a built-in LED light. There are only a few elements users need to be aware of. With the help of a Snap-on connector, it can be easily connected to a tire without any loose air. The air compressor also comes with included accessories such as inflatable adaptors. The Presta valve for bicycles is included. 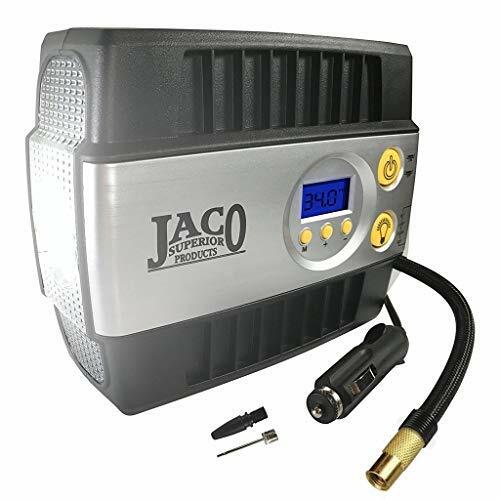 The design of the air compressor features a front LED light. For it to work, the air compression actually needs to be connected to the car’s cigarette lighter. The compressor also features a side LCD display which shows the PSI pressure of the tire or inflated object. With a short list of features, the compressor is very easy to use. It comes with a few buttons to switch on inflation or the front light. Most importantly, it comes with fast inflation results. Compared to most other handheld air compressors, it comes with quick results. A normal car tire can be inflated to 35 PSI within 3 minutes. This can even see is as twice as fast compared to other compressors. But this extra-fast capacity of the air compressor should not be confused with a professional tool. For this reason, it is actually not recommended for trucks. But for cars and vans, it offers good results. Interestingly, the air compressor can be used with an AC/DC converter. But users need to purchase the converter separately if looking to use the compressor outside car purposes. With inflating accuracy results within +/-1, the air compressor can be used on many other objects such as an inflatable home swimming pool. Its 13-feet reach makes it one of the most versatile products in its class. It even comes with advanced functions such as auto shut-off to protect its microprocessor from overheating. With 3-minute tire inflation, it is the air compressor to consider for those who drive every day. The super-bright LED light is also a good addition for quick roadside inflation. 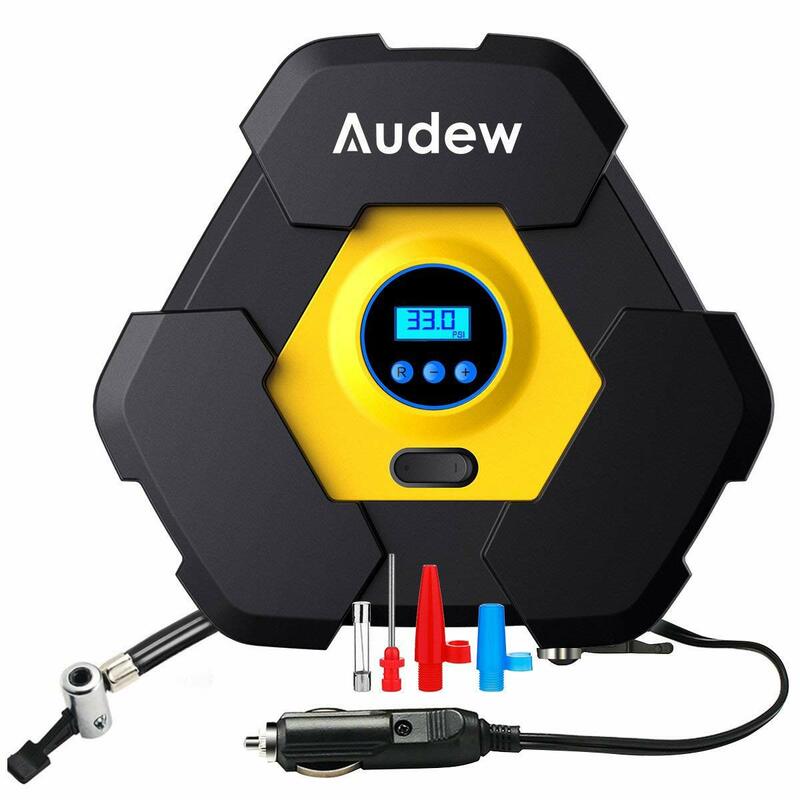 Why we like it: Testing tire pressure is easy with the Audew air compressor as it comes with an integrated digital reader. 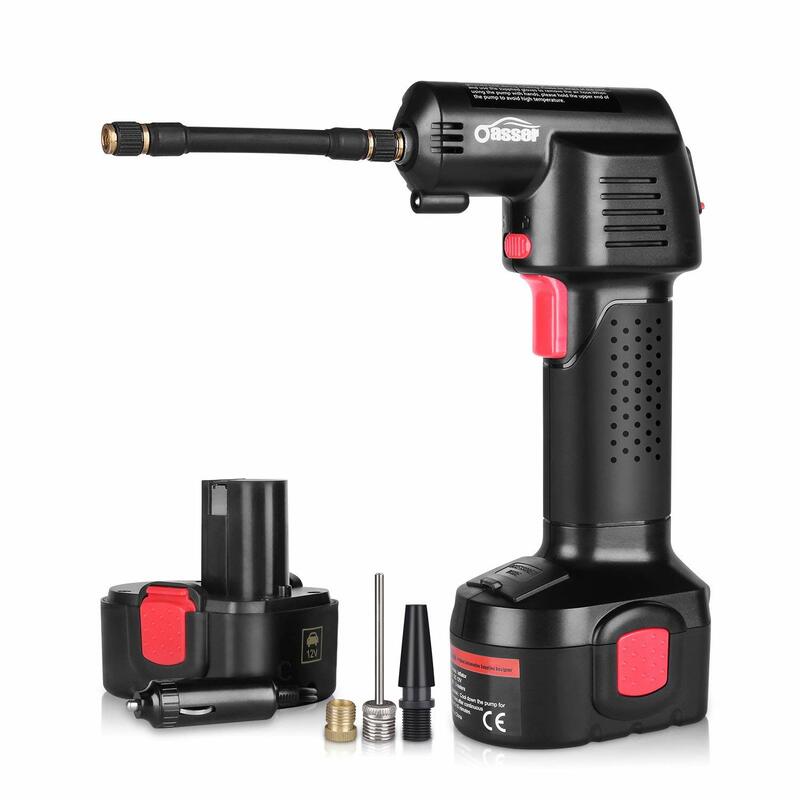 Powered by a 12V cigarette lighter plug, the air compressor is among the reliable solutions in its class. It comes with good performance when it comes to reliability. As one of the affordable compressors, it uses durable plastic materials to protect its internal circuits from scratches or physical shocks. While it is not shaped similarly to a conventional air compressor, it still manages to offer roadside practicality. A built-in LED light allows this rather large air compressor to deliver results even in low light conditions. Even more, it manages to offer quick results, which is important when dealing with flat tires. The Snap-on connector allows quick tire inflation. While it is not as fast as some of the leading options in its class, it still inflates a car’s tire in minutes. The backlit digital display helps as well. It allows drivers to quickly check the tire pressure if they feeling something could be wrong. This can be the case in situations where drivers here noise from the tire which could mean a puncture needs to be solved. There are only a few buttons used on the air compressor. They represent a simple solution for most drivers who have not used such equipment before. Its preset pressure is 35PSI. Unfortunately, this standard preset cannot be saved to another value, similarly to the limitations of most other air compressors. With a power of 35L per minute, the air compressor manages to represent a solution for active users as well. With three included nozzles, it can inflate basketballs, soccer balls or bike tires. It is just a shame that it cannot handle AC power for even more versatility. With a distinct design, this handheld air compressor stands out with its ease of use and standard 35PSI preset. Why we like it: The air compressor works with preset tire pressure which recommends it for effortless functionality. 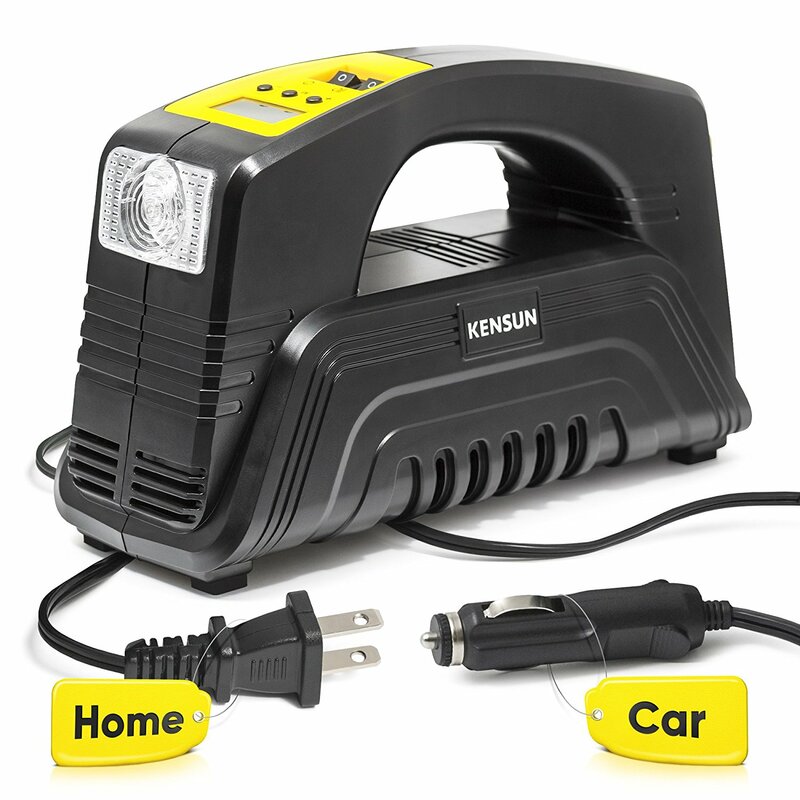 One of the unique design characteristics of the handheld air compressor comes with its large LED light. It can be considered one of the most capable lights in its class as a result. Drivers living in remote areas or those who simply constantly drive outside city limits can consider this air compressor with its large light. The light has its own manual switch operation. 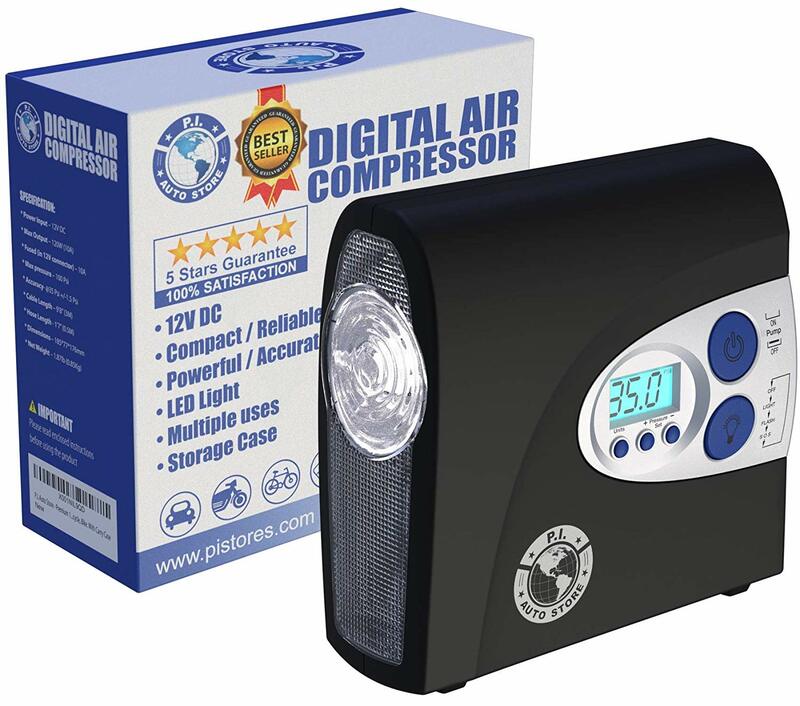 With an included digital display, the air compressor allows easy tracking, especially in the conditions in which it is used with preset pressure. But it can also be a quickly diagnose tool to test the actual tire pressure when needed. The distinct characteristics of the handheld air compressor are given by its preset functionality. Each tire can handle slightly different pressures and this is not a problem for the compressor. Digitally adjusting the desired pressure is possible. The air compressor then works until the tire is inflated to the desired pressure. With presets of up to 45 PSI on cars and up to 100 PSI on bikes, it is very easy to use. 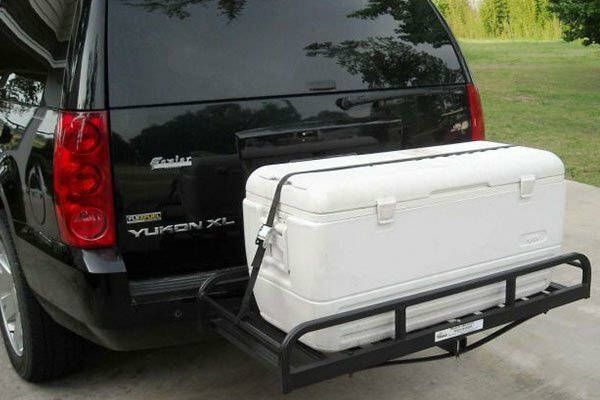 With the help of a 10-feet power cord, the air compressor can easily reach the back tires of an SUV. However, it is not recommended for most vans or trucks. With a capacity of 25L per minute, it is also not the fastest air compressor in its class. However, its added functions such as the bright red LED signal light can make it a good option for a number of drivers. Dedicated to those who need extra light to solve any type of tire pressure loss, the handheld air compressor is easy to use. Why we like it: This elegant air compressor is recommended for fast tire inflation. It inflates a car’s tire in 4.8 minutes. 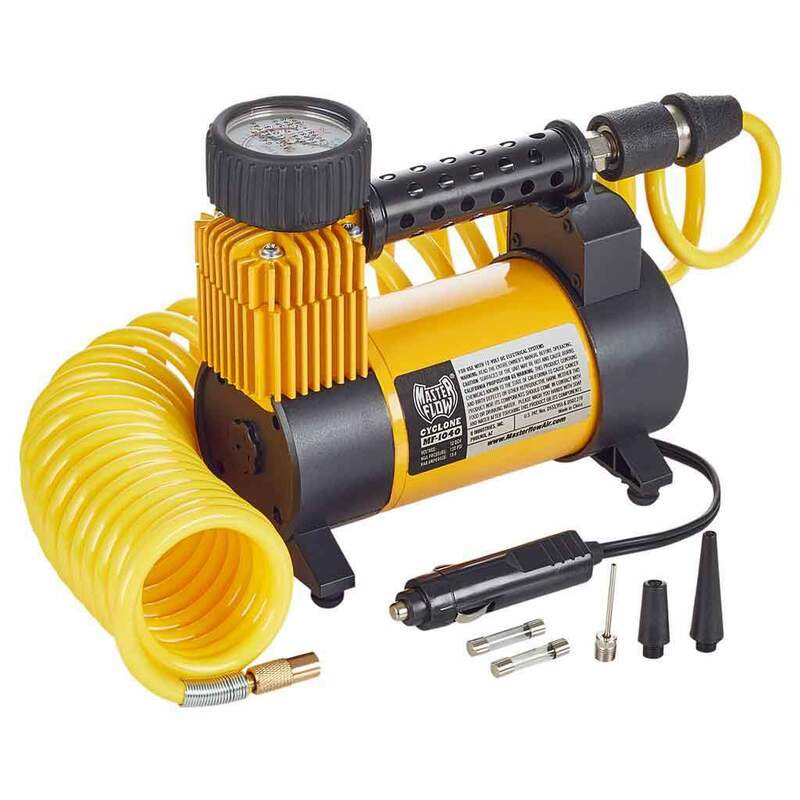 The handheld air compressor comes with an included handle for easy transportation. At a length of only 18cm, it can be considered as one of the compact options in its class. Characterized by a durable construction, the air compressor can be used for years and years. As most leading air compressors, it comes with a built-in digital display. Those wanting to check tire pressure or basketball pressure can do so in seconds. With a 10-feet power cord, it connects directly to the car’s cigarette lighter. Unfortunately, it doesn’t come with an AC adapter. But for inflating tires, it does its job well. With tires inflated in 4.8 minutes at maximum 35PSI, the air compressor is recommended for most modern drivers. Higher pressure can be seen on bike tires. But the compressor handles constant pressure at 50PSI with maximum inflation of 150PSI. Additional adapters are also shipped with the air compressor. They are recommended for all types of on-the-go inflation needs. Weekends away might mean that drivers can inflate their bikes or sports balls to have some fun while away from home. With simple operation, the air compressor only uses 4 buttons to control tire pressure. Even with no previous training, it still allows drivers to use it without any special settings or configuration. As a simple no-thrills air compressor, it is a solution for the everyday driver. Its size also recommends it for trunk storage. Why we like it: This simple analog air compressor is a proper old-school solution to keep tires inflated. Made with durable construction, the air compressor represents an affordable solution for those unwilling to spend too much to get their tires inflated. But this doesn’t mean that it is not reliable. The first design characteristic to notice comes with an included front LED light. To keep tires inflated during the night, the LED light can be powered but only when the air compressor is connected to the car’s cigarette lighter. There is an analog pressure display on the front side of the air compressor. It allows drivers to see the pressure from zero to 100 PSI. Even more, this simple display allows real-time pressure tracking while inflating a tire. It takes about 8 minutes to inflate a tire completely. Even if this is not the fastest inflation on the market, it may still be enough when it comes to dealing with occasional work. Most drivers rarely tackle tires and it might not be worth investing in a faster handheld air compressor as a result. The built-in dual gauge allows monitoring up of up to 100 PSI. This is why the air compressor can also be used on bike tires. At 1.85 pounds, the air compressor is lightweight. It represents a simple solution which doesn’t need too much strength and which can be operated by both men and women. At the same time, there are a few drawbacks which come with the air compressor. For example, there is no on/off switch on the LED light. This means the light works whenever the air compressor is connected to the cigarette lighter. It may not be a major inconvenient. It is actually one of the compromises made to keep its price low. Some users also report that the air compressor doesn’t come with a plastic cover for the cord’s housing. Others have noted that the air compressor is quite loud compared to other products. But if these small problems can be overlooked, the air compressor can offer reliable inflation. With an affordable profile, the air compressor can be used both during the day and during the night. Why we like it: This air compressor comes with rechargeable batteries and offers a quick solution to corded air compressors. 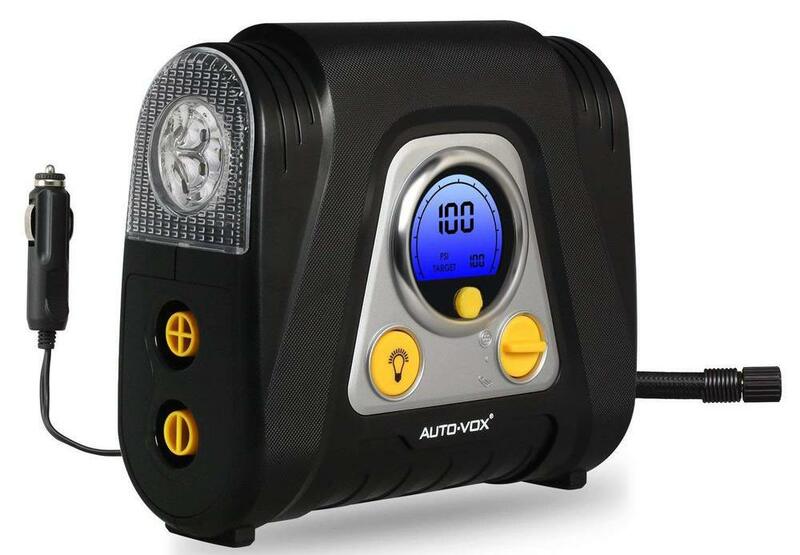 Powered by rechargeable batteries, the air compressor is a cordless solution to inflate car or bike tires together with sporting equipment. 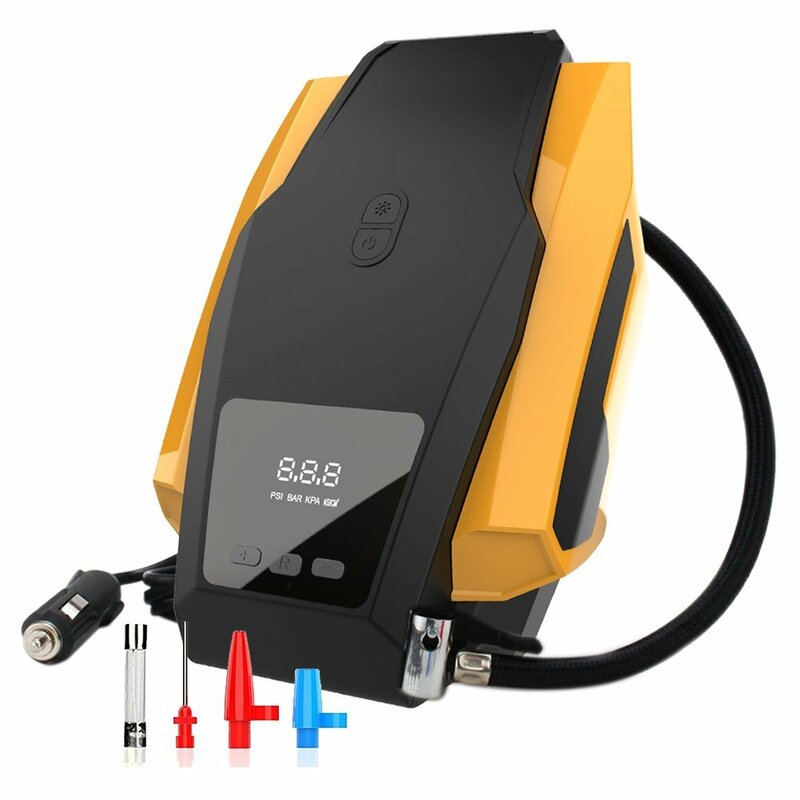 Based on 2200 mAh batteries, the air compressor also comes with a built-in LCD display. It is here that users can check tire pressure. In this display, the units can be changed from PSI to BAR or kg/cm2. The same LCD display can be used to set the air compressor to a certain pressure. It is convenient that the air compressor handles direct power from the car’s cigarette lighter as well as from the included batteries. Up to 130 PSI can be achieved with these power options. Another convenient feature comes in the form of various nozzles and air hoses. This is where users can have their own air compressor for various inflatable products around the house from toys to tires. Of course, due to its compact size, it comes with a smaller LED light compared to other air compressors. With one of the most practical designs, the air compressor can be used by those seeking a portable solution with its own rechargeable batteries. Why we like it: With an elegant design, this air compressor is recommended for those who also focus on equipment aesthetics. As one of the most elegant designs in its class, the air compressor is surely hitting home with many drivers. It comes with an elegant display and elegant controls. The display shows pressure in PSI, BAR, and kg/cm2. Below it, users can find the upward and downward pressure controls. Above the screen, there are only two buttons for turning the air compressor on or off as well as for turning the LED light on or off. With automated presets, drivers can set their own tire pressure and let the machine do the rest. With a capacity of 35L/minute, it is among the strongest air compressors on the market. It should not take more than 6 minutes to completely inflate a tire. At 150 PSI maximum inflation, the handheld air compressor can be used on motorcycles or bikes as well. With three extra nozzles, the handheld air compressor can be used on various inflatable products such as a home swimming pool or an air mattress. However, with a shorter power cable and power connectivity at 12V, these products would have to be moved close to the car. 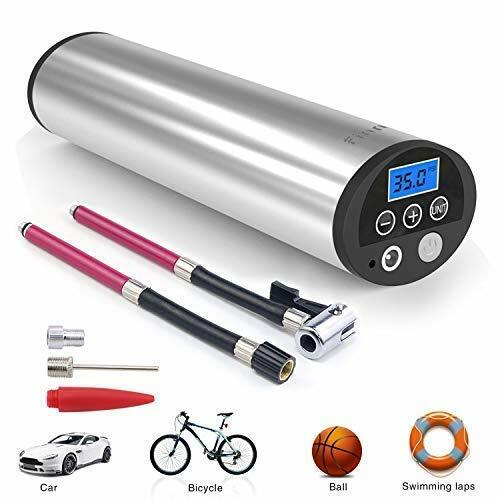 Those who simply look for a good air compressor for their cars can find one of the most beautiful machines in the Auto Tire Inflator. With such a distinct design, the air compressor still manages to fully inflate a car’s tire in minutes. I have never used a handheld air compressor, can I still order one? If you have never used a handheld air compressor, you can still purchase one and use it according to its instructions manual. Most products come with a short learning curve. Can I use a handheld air compressor outside my car? If you want to inflate a bike’s tires or a basketball, you should ensure that the air compressor can reach the distance. Some air compressors are based on battery performance so they can be used around the home. Which tire pressure do I need to consider? Each tire is different. Make sure to check the side of the tire for recommended pressure marks. My air compressor overheats, what should I do? If your air compressor is too hot, you should allow it to cool down. Only the best air compressors come with auto shut-off functions for better protection. Those unsure about what to look for in the best handheld air compressor need to start at the basic characteristics. From PSI performance to the power options, there are a few characteristics to consider and safety standards to meet by all handheld air compressors. A handheld air compressor comes with a certain power. This power can be measured in the airflow which is measured in liters per minute. Most air compressors in this category come with a capacity between 25 liters and 35 liters per minute. The most powerful handheld air compressors are more expensive as well. But the return is a considerably lower time needed to fully inflate a car’s tire. Measuring tire pressure can be done using different scales. Most air compressors use PSI readings. Others can use a BAR or kg/cm2 for a more tailored measurement. But each tire comes with its own recommended pressure from its own manufacturer. It is why the pressure measurement can come in the form of a digital or analog display. Most of these displays actually show accurate information. The margin for error sits between +/-2 and +/-0.5 for the best air compressors. In order to achieve the best results in terms of tire durability and performance, tire pressure needs to be checked at regular intervals. Simply adding more air should not take too long when a tire is already inflated. The same goes for sporting equipment such as basketball. In some cases, air compressors also come with added nozzles. These nozzles can be used for basketballs, soccer balls, and inflatable swimming pools. As with tires, these products have their own maximum and minimum pressure. In the right conditions, this maximum point can be preset from the air compressor. The user simply sets the desired pressure and steps back while the air compressor does the job. Most air compressors also come with a default pressure which is usually around 35PSI. It is why after each use, most air compressors actually default back to this value. LED lights are not mandatory on handheld air compressors. But at the same time, they can create the right environment when it comes to tire inflation during the night. In some cases, especially when driving or cycling outside city limits, users simply need to ensure they have what it takes to deal with a puncture or pressure loss on their car’s tires. LED lights come in different shapes and sizes. Some air compressors even allow users to control these lights by switching them on only when needed. More basic air compressors come with lights which are switched on at all times or even no lights at all. The battle for the best air compressor is often given with power options. From cigarette lighters in the car to AC wall outlet connectivity, this is an important characteristic to consider. Even in the conditions in which the air compressor is only used in the car, it is still worth investing a bit more to get the extra freedom of AC connectivity. Other air compressors come with built-in batteries. These products are the ultimate solution for power freedom. 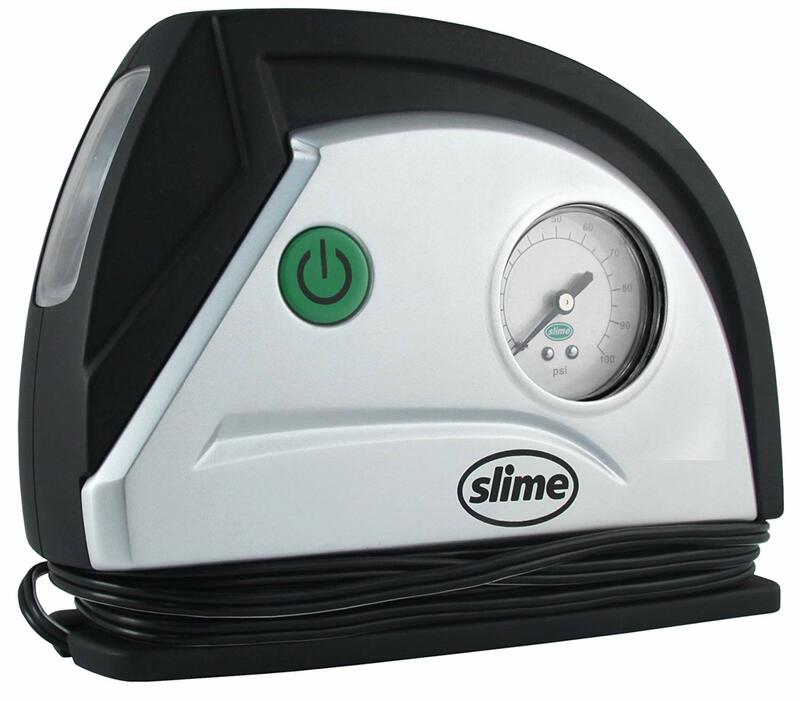 Unlike other products in their class, the air compressors with built-in batteries allow users to use the equipment on other products around the house without bringing them next to the car. Some of the best handheld air compressors combine these power connectivity options with both corded and cordless designs. Not all cars have dedicated storage space for a portable air compressor. It is why drivers need to find the right space in the trunk for an air compressor. Ideally, the product would be secured in a place around the trunk. 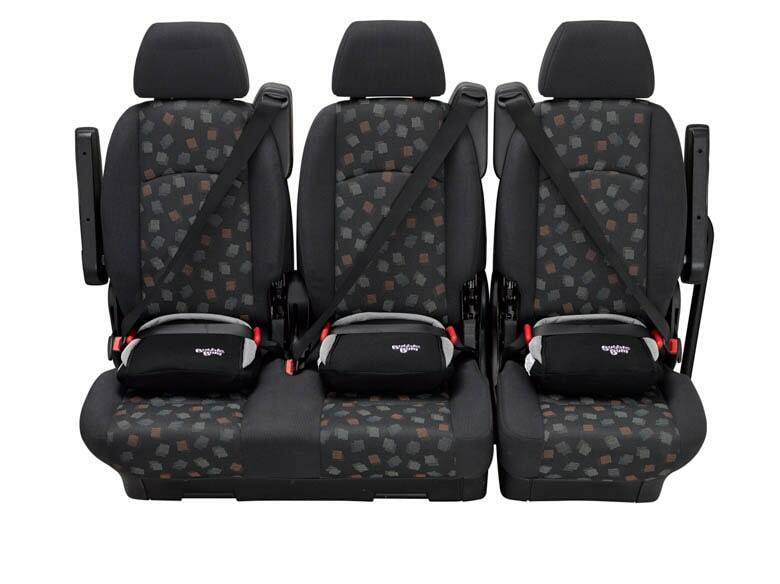 At the same time, some air compressors can also be stored underneath an SUV seat in dedicated spots. However, the available storage space can actually detect the type of air compressor to be purchased. When it comes to the best handheld air compressor, its selection process is important. It is rare for a driver to actually upgrade an air compressor unless there’s something wrong with it. This is why the choice needs to be right from the start. From compact options which are as small as a hand to larger options which need to be handheld, there are plenty of great options to consider. Apart from the obvious characteristics, it is also worth having a look at the product’s warranty. Being an electrical product, it needs to be covered by the manufacturer’s warranty. Most products are covered for periods between a year and 18 months. Products which come with shorter warranties might not fit into the best air compressors category. At the same time, air compressors need to be easy to use. Gone are the days when these products were made with complicated controls. Drivers are now encouraged to spend as less time as possible inflating tires or checking tire pressure. It is why some of the best air compressors on the market in the handheld category can actually inflate a tire from zero to 35 PSI in just a few minutes. However, this is not the only characteristic to look at. Since they are not too expensive, it is also worth having look at the most versatile handheld air compressors as they will offer the most benefits in the long term.